Gordon Brown, Prime minister of United Kingdom, decided the partial nationalization of eight British banks on October 8, 2008. On October 8, 2008 is situated at 11°38′ of Virgo. It’s close to the degree of Sun (12°43′). This position of the Sun in Virgo has an opposition with native Saturn (22°31′ of Pisces) and with the transit of Uranus (19°42′ of Pisces). It has also a conjunction with native Neptune (14°25′ of Virgo) and with the transit of Saturn (16°08′ of Virgo). The degree of the day is in House IX, that of foreign. The degree of the Sun in Virgo has a Powerfull force. It arouses the light of media for this event. The double Saturn, of Evil quality en Pisces-Virgo close to the axis of Houses IV/X confirms a real-estate crisis (House IV) and a bankruptcy (as governor of the House II). Neptune, the god of seas into House IX, is an analogy that indicates the United Kingdom who ruled over seas for a long time. 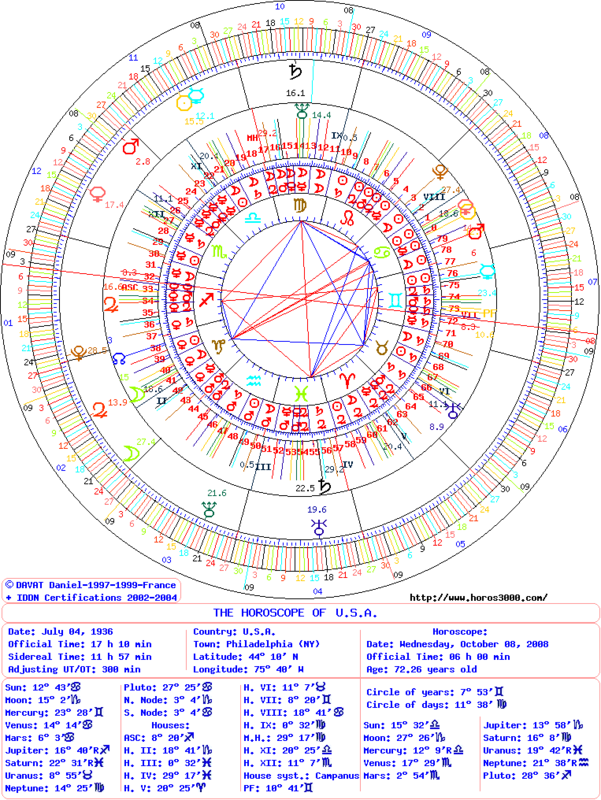 On Wednesday (blue line) October 8, 2008 is situated at 11° of Virgo. The degree of the day is in natal House IX, that of foreign. It is situated also in House V of SR, that of the speculation. It has an opposition with natal Saturn close to the natal House IV, that of the real-estate and it has an Evil quality in Pisces. It is also jointed with la conjunction Saturn, Mars (of SR). 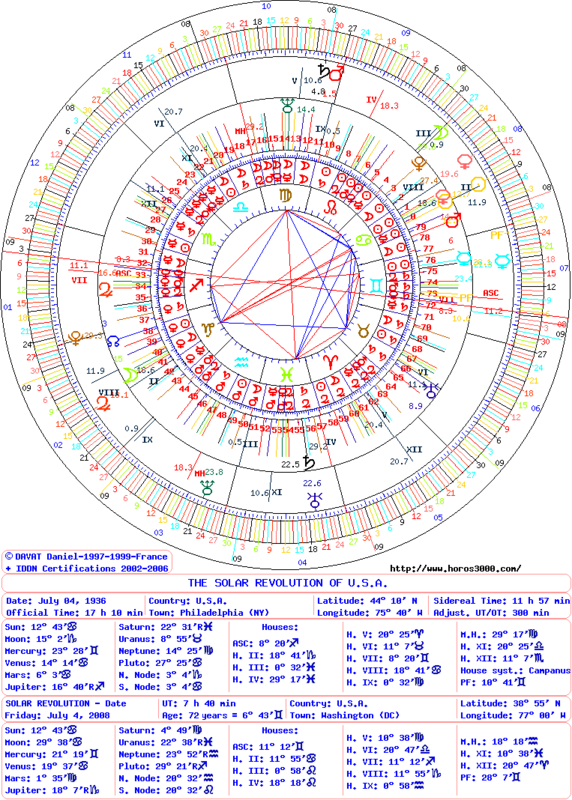 They are the two governors of the natal House II, that of finances situated in Capricorn (18°41′). They have Evil qualities in Virgo in House IV of SR, that of the real-estate. Neptune, the god of seas into natal House IX, indicates the United Kingdom who ruled over seas. This entry was posted on Thursday, January 3rd, 2013 at 2:53 pmand is filed under Finances. Both comments and pings are currently closed.